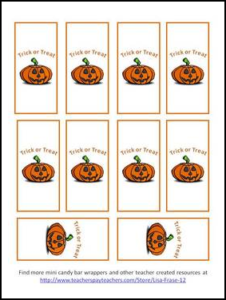 This pdf file contains a set of 10 miniature candy bar wrappers for Halloween. Simply print, cut, and wrap the wrappers around a mini candy bar. They are great for treats for your class, trick or treaters, faculty meetings, parties, and more!